Most of the major currencies are trading higher this morning ahead of Fed Chair Powell’s speech at Jackson Hole. We know that Powell and Poloz will be the only central bank leaders attending as Draghi, Carney and Kuroda stay behind. Judging from the price action of USDJPY, investors are cautiously concerned that Powell will talk down the dollar because while USD/JPY is holding onto yesterday’s gains, the greenback is trading lower against all other major currencies. AUD/USD traders may be legitimately satisfied with the political resolution in Australia, but relations between the US and China remain chill as their trade talks end with no real resolution. Although the EURO is trading well today, we are growing increasingly concerned about the currency because Italian bond yields are closing in on their highest level in 4 years. We’re only about 4bp from there. Sterling traded strongly overnight and could experience a further squeeze up to 1.29. Higher oil prices and risk appetite is driving USD/CAD lower with the pair likely to make move down to 1.3050. The New Zealand dollar should follow AUD higher especially after last night’s trade data. The greenback is trading with a softer bias ahead of Powell and the selling pressure could remain in place before the Fed Chair speaks. The U.S. dollar is trading lower against all of the major currencies this morning with the exception of the Japanese Yen. Although the greenback was hit hard in the past 24 hours by President Trump’s criticism of the Fed, they will not affect monetary policy. But it was the perfect excuse for USD bulls to abandon their positions. In the Asia session overnight, the selling gained momentum after EUR/USD broke through 1.15 -- stops were triggered and EUR/USD rallied quickly, taking all of the major currencies higher along with it. However the rally stopped right at the 20-day SMA for EUR/USD and its not clear if the pair will have the momentum to extend beyond that level. The best performing currency this morning is the New Zealand dollar but NZD is vulnerable to losses if dairy prices fail to rise at today’s auction. AUD and CAD are also higher with the loonie likely to gain traction in the North American session for a potential test of 1.30. Last night’s RBA minutes had very little impact on AUD. Brexit talks are underway this morning so GBP could be vulnerable to headline risk but right now it looks like it wants to make a run to 1.2875. Stocks are up, yields are up and oil prices are moving higher -- all signs of a risk on rally. The U.S. dollar is extending its gains following yesterday’s hawkish comments from Fed Chair Powell. On Day 2 of his Congressional testimony, investors expect the same sense of optimism. USD/JPY is hovering just under 113 and while another probe above that level seems imminent, we don’t expect a material extension as the second day of his semi-annual testimony is rarely as market moving as the first. However the Beige Book, scheduled for release in the afternoon should reinforce the dollar’s positive bias. Sterling is under the greatest pressure as inflation growth slows on a consumer and producer level. CPI also fell in the Eurozone causing EURUSD to eye a break of 1.16 and GBP/USD teasing a move below 1.30. With oil prices falling further this morning, USD/CAD will try to break 1.3250. Commodity currencies in general are under pressure and we expect this same underperformance today. At first glance, it appears that the U.S. dollar is under pressure against all of the major currencies as investors wait for Trump’s list of tariffs on China. However on an intraday basis, USD/JPY is holding onto its gains into the NY open and trying to edge slightly higher. With that in mind, a trade war is bad for everyone and negative for risk appetite so its difficult to imagine that we’ll see significant rallies in currencies today. Canada has the largest decline in 10 year yields which explains why CAD is also the weakest currency but after having breached 1.3150, the pair is due for a correction. EUR is struggling to recapture 1.16 and took hit from reports that Angela Merkel’s government is at the brink as its coalition partner plans to end their alliance. While the currency recovered its initial losses this development should limit the recovery in EUR/USD. The Australian and New Zealand dollars are under pressure with NZD leading the slide after weaker manufacturing PMI numbers. The Yen seems to be unfazed by the Bank of Japan’s lowered CPI assessment. The U.S.’ Empire State manufacturing survey and University of Michigan Consumer Sentiment report are scheduled for release today but the main focus will be on China tariffs. One of my strongest views today is GBP outperformance. All of the major currencies are trading higher this morning with EUR/USD above 1.1750, USD/JPY above 110 and GBP/USD above 1.34. Euro is benefitting from ECB comments relating to an earlier taper -- a view that we have emphasized after the 9 cent drop in the euro. Buyers continue to snap up USD/JPY ahead of next week’s Federal Reserve meeting. The Australian dollar also erased yesterday’s losses after a much stronger than expected GDP report. Risk ON is helping to take CAD and NZD higher as well and its no surprise to see the CHF and JPY underperform in a positive market environment like today. Yields are up across the board and equity futures point to a positive open. The Canadian dollar is in playwith trade balance and IVEY PMI reports scheduled for release -- the Bank of Canada’s optimism suggests that we could see firmer numbers. U.S. trade on the other hand could fall short of expectations given the strength of the dollar last month and the drop in the manufacturing ISM report. The U.S. dollar higher across the board this morning as ten year Treasury yields trade above 3%. With no U.S. economic reports on the calendar, the dollar will take its cue from yields which are likely to volatile during the NY trading session as investors decide whether U.S. rates should stay above or below this key level. All of the major currencies are hit by the dollar strength but an ECB meeting on the calendar tomorrow leaved the euro is particularly vulnerable. With that in mind, the worst performing currencies this morning and the comm dollars which extended their losses on the back of falling commodity prices. Sterling and the Japanese Yen are the most resilient and that’s likely to remain the case as USD/JPY looks at a slow climb upwards. Stock futures are signaling a lower open that could add pressure on high beta currencies. Most of the major currencies are trading lower against the U.S. dollar this morning on the back of softer data. The EUR was hit by a lower ZEW survey, GBP fell on the back of weaker earnings, AUD and NZD are pressured by lower industrial production and quarterly GDP growth in China. The U.S. and Canadian dollars are the only ones unaffected so far and the greenback shouldn’t be significantly impacted by this morning’s housing and industrial production reports. Canada has manufacturing sales and the loonie is holding onto its gains ahead of Wednesday’s Bank of Canada monetary policy announcement. The weakest currency today is NZD followed by the Swiss Franc. With Dow futures pointing to a positive open and U.S. Treasury yields ticking slightly higher, today may be a day of pro rather than anti-risk that could see gains for USD/JPY. This view was borne out by the dovish ECB minutes which suggested that the council intends to keep rates at zero for the foreseeable future even as it proceeds with the taper. All of this dovish news helped push EURGBP to its lowest level in more than a year, but whether the pair remains below .8700 will be contingent on UK politics and monetary policy. If anything UK economy is in worse shape the EU’s and any rate hike by the BoE could only exacerbate the slowdown. 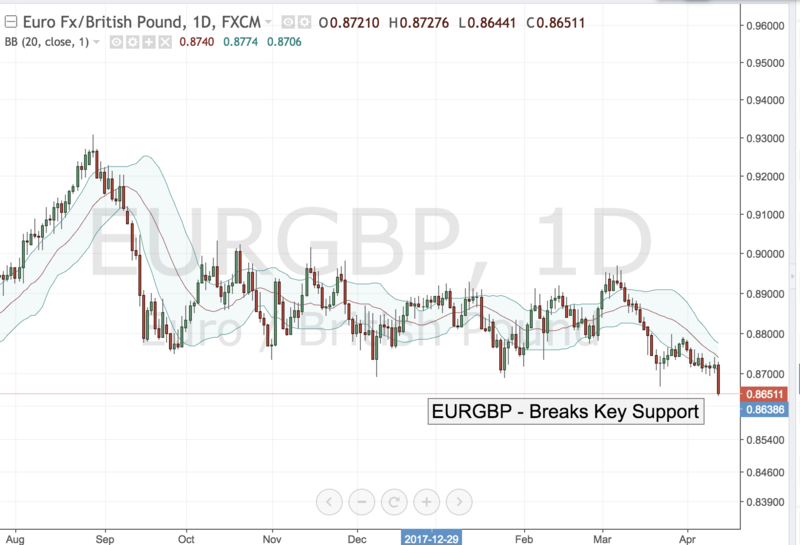 Combine that with the fact that Brexit negotiations are still stuck on the Irish border issue and the EURGBP break could well be a fakeout that traps eager shorts trying to ride the momentum. The U.S. dollar is trading lower against all of the major currencies this morning as investors wait for the next shoe to drop. With President Trump set to announce a response to the chemical attacks in Syria, ongoing trade tensions, the NAFTA meeting and the investigations in Russia / Trump’s lawyer, there’s significant headline risk today. U.S. CPI is expected to tip higher given stronger PPI and gas prices but the impact on the greenback may be limited. The FOMC minutes are also due later this afternoon. The best performing currencies this morning are the euro and Japanese Yen. Mario Draghi is speaking but so far there hasn’t been any significant headlines. We are also seeing some profit taking in the commodity currencies as European equities sell off and Dow futures point to a lower open. Global bond yields are down across the board which is adding pressure on USD, EUR and GBP. The U.S. dollar is trading higher against all of the major currencies this morning thanks to yesterday’s strong reversal in U.S. stocks and overnight strength in Asian and European equities. For what its worth, Dow futures are pointing to a positive open with bond yields up across the board. This should be drive risk currencies higher but is supporting the greenback instead. Part of this has to do with softer UK and EZ PMIs, which have driven euro and sterling lower. USD/JPY made a run for 107 but with the 50-day SMA capping gains, we have not seen much continuation. The commodity currencies are weak but AUD and NZD are trying to come back while the Canadian dollar slips ahead of its trade balance report. There was a big upside surprise in last month’s release which has investors looking for softer numbers. From the U.S., weekly jobless claims and trade balance are scheduled for release but these reports tend to have only limited impact on the greenback.